Campsfield House is an Immigration Removal (detention) Centre at Kidlington, six miles from Oxford. It is a prison run for private profit by Mitie, supervised by Home Office immigration officials. It used to be a youth detention centre, but it re-opened as an Immigration Detention Centre in November 1993. The local parish council was opposed to it, but their wishes were overruled by the Home Office. Since 1993, the local Cherwell District Council, Oxford City Council and Oxfordshire County Council have all called for the centre either to be closed or not to be expanded. Its closure has been called for by local trade unions, the Oxford & District Trades Union Council, student, faith and human rights organisations. There are up to 281 detainees in Campsfield House. Many are refugees fleeing danger, torture and even death from countries such as Iran, Iraq, Afghanistan and Somalia. Their status is that of asylum seeker whose claim is being ‘considered’ or whose claim has been refused. Others are ‘overstayers’ who have overstayed their visa, Foreign National Offenders who have committed a crime, served their sentence and then get double punishment – immigration detention and a deportation order – and some are detainees wanting to go home but who may wait in detention for months before arrangements are made, or in some cases removal is not possible, usually where those held are deemed to be stateless. They are held without charge, without time limit, without proper reasons given, and without proper access to legal representation. Amnesty International report that these are breaches of internationally recognised human rights. Authorities and organisations such as Chief Inspector of Prisons, the Medical Foundation for the Care of Victims of Torture, and Medical Justice, have condemned conditions at Campsfield House. 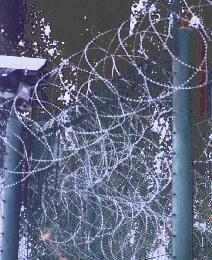 Detainees at Campsfield `House’ are held behind a twenty-foot high razor-wire topped fence. Throughout the centre there are surveillance cameras, and friends and relatives wishing to visit detainees are searched before passing through five separate remote-controlled doors. Campsfield House operates as a high-security prison. Please include me as a supporter to the Campaign I am a member of Bristol Defend Asylum Seekers Campaign.